Upon us, fellow Ukrainians, fate shall smile once again. – What Happened and Why? – What is the Larger Meaning for U.S. Interests and Strategy? The direct cause of the protest was President Yanukovich’s rejection of the European Union Association Agreement. Aleksander Kwasniewski, former president of Poland, said that protests were predictable as one half of Ukraine wants to join the EU and the other half was persuaded by Yanukovich for three years that the agreement should be signed. So nearly everyone was surprised when the agreement was discarded. 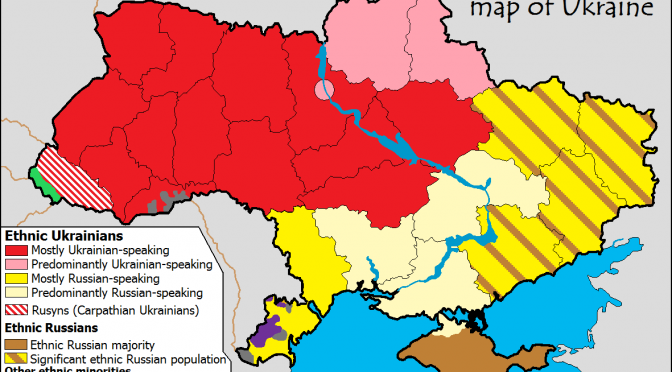 Commenters often talk about two parts of Ukraine that are very different. This is true, there is a difference in culture, religion, and business preferences, which comes from history. But both parts want to live in independent Ukraine, without neighbors interfering in domestic matters, and they want to have a chance to realize their ambitions. For many of us this sounds natural, sentimental, or simply trivial. This is a very old nation but very young state. Ukraine gained independence for a brief period between 1918 and 1920 and most recently again in 1991. Not surprisingly they are very sensitive to problems of national independence. Nationalism is strong and could be equally constructive or destructive. The fact that Ukraine was and continues to be very important to Russia, doesn’t help. And it makes a difference. We speak about the vital interests of a former hegemon and a country that has the ambition to regain its status as a world-class power. “We do not understand what is going on there. There is a real threat to our interests and to the lives of our citizens,” Prime Minister Dmitry Medvedev was quoted by Russian news agencies as saying. 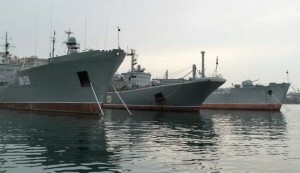 Russian naval vessels in Sevastopol, Ukraine. Strong rhetoric is not a mere ghost from the past. It is a sign that other tools from the Soviet epoch could also find their way into the hands of state leaders. We could witness subtle diplomacy interweaving with hard politics. The references to Russian citizens are especially worrisome. It seems natural, but we shouldn’t forget that there is a strong ethnic Russian minority in Crimea [who reportedly “elected” a Russian citizen as mayor this week] and that Sevastopol is a major naval base for Black Sea Fleet. The situation seems to be serious enough to cause a series of public statements by officials from both the United States and Poland. On Feb 23rd, the U.S. State Department on Twitter said “US expects Ukraine’s sovereignty, territorial integrity, democratic freedom of choice to be respected by all states”. Prof. Stanislaw Koziej, Chief of BBN (Poland’s National Security Counsel) expressed his concern more directly: “Intervention in Ukraine by foreign power would have significant consequences for international security”. From the geo-strategic point of view, the big problem is that any formal or institutional link of Ukraine with the EU drastically limits Russia’s options and potential to influence this country. What does this mean for the United States? Even if it doesn’t seem to be a priority, Ukraine’s future could have many indirect and strategic consequences. If the United States really believes in its values, it needs to respect the sovereign decision of Ukrainians. However, any chance of a scenario in which a weak Ukraine becomes a satellite state to Russia, would certainly resonate in all of Central Europe. That means adapting strategy, military modernization programs, and priorities at the NATO Summit in Wales, UK. A Strong or stronger Russia in this region is also an argument in favor of the “Three-Hub Navy” proposed by Brian McGrath. But even then the hub in the Mediterranean still wouldn’t be among the top strategic priorities until we will assume that a powerful Russian Federation is a link between Europe and Asia. Russia is absent from most discussions about the Rebalance to the Pacific or events in China’s Near Seas, perhaps because the focus is on South China Sea. The way the Russian Federation is going to protect their interests in the Far East and Arctic, and interact with major players there, is likely to impact perceptions of security at least in Central Europe if not in the whole of Europe. Any discussion about the future of Ukraine is impossible without considering the broader context in which Russia plays a key role. It has been this way for centuries. Poland is ready to offer its own experiences with the transformation process, which was long and painful, but the U.S. is probably the only power capable to persuade an assertive Russia. Przemek Krajewski alias Viribus Unitis is a blogger In Poland. His area of interest is the context, purpose, and structure of navies – and promoting discussion on these subjects in his country.